1: We're working on scrapbooks for Rob Thomas, Warner Bros, and Kristen Bell. 2: The purpose of the scrapbooks is to show how much Veronica Mars means to us and why we need more! 3: Please only write to one person per letter. So write individually to all three! 4: Make sure you indicate which person you are writing to. It'll be easier to sort through them and know which scrapbook to put them in. 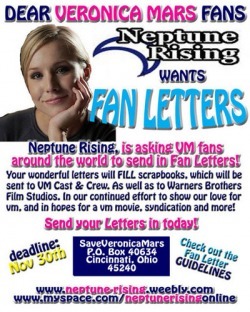 The purpose of the scrapbooks is to show how much Veronica Mars means to us and why we need more! To make the scrapbooks, we need letters from fans. Sending big scrapbooks to Rob Thomas and Warner Bros could possibly make a huge impact. Kristen Bell said she'd be willing to take on more Veronica Mars, so hers is more of a "Thank you" scrapbook. If you know others that would be interested, tell them about it! Anyone can write letters for the scrapbooks. Spread the word. We're only a couple of people and we need all the help we can get.